Random Thoughts---Naba: Thank God For That! What is the most depressing thing around you? Or, rather what is that one thing that succeeds in lowering your spirits every single time? While you contemplate on that, I’ll tell you about one such thing that always manages to take away all the sunshine from my day. The infamous Indian main stream media, or MSM as they are fondly called. Yes, you read it right. You have got to see the venom they spill, the deliberate negativity they plant, to understand what I mean. It seems as though they have not a semblance of shame left anymore. But why am I talking about them here? Don’t worry I’m not here to dampen your spirits with a gloomy post, that too on a Friday. I just mentioned the MSM to state that avoiding them consciously is one of those things I have been grateful for this week. Oh! So very grateful indeed! You guessed it right, it’s a going to be a gratitude laden post, this. A bunch of positive affirmations, you could say, at one place, to start off the weekend. Once in a while it’s good to be thankful for all the things that haven’t gone wrong in life. Once in a while it’s good to consciously smile at your blessings. So, here I’m, the habitually cynical me, to spread some positive vibes. It is kind of an anomaly when I stop to appreciate the positives around me, attempting to be thankful, because my natural instinct is actually to immediately pounce on the negatives. Not a great thing to admit about myself but it is what it is. Unrestricted internet access at office without which the past year at work would have been exceptionally boring. Knowing that it is going to be taken away in a few days, the appreciation for it seems to have grown manifolds. The generator at my apartment! I wonder what I would have done without it. My cook who saves me from having to toil in the kitchen. I get so much time to do nothing and I love it too. My job. Yes, it might come as a surprise for the regular readers of my blog because everyone knows I detest it from the bottom of my heart. In fact, even I’m amazed at this sudden outpour of appreciation for it. But when I think about it deeply, I realize, this job actually helps me with quite a number of things. Well, I think maturity has finally set in and I should be grateful for that too, shouldn’t I? A health checkup that went well without any surprises. The fact that S and I decided to get our own place. It’s so much better to pay EMIs rather than increase the bank balance of greedy landlords. The wonderful Bangalore weather which makes everything even more enjoyable. The ginger tea at work. What would I have done without it? New chairs at work which have helped in reducing my back aches considerably for the past few days. S for helping me with changing the template of my blog. Only he has the patience to sit the whole day and work on it! For the readers of my blog, yes you included. You wonderful people could have been doing anything else in the world but still choose to stop, read my ramblings and drop in a line or two, sometimes more, just for me. Thank You! Well, that’s about it for today. But do share what you are grateful for. Let’s appreciate life a bit more! 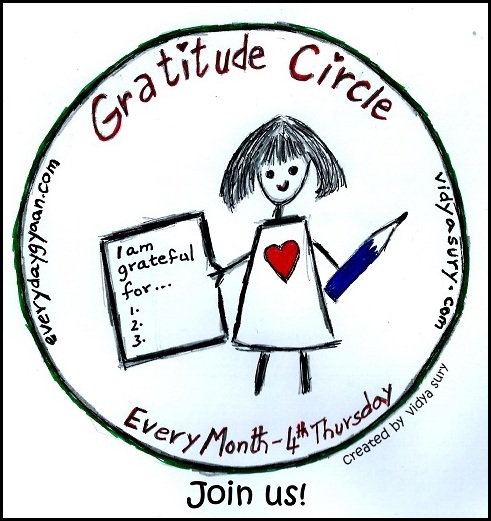 Linking this post to the Gratitude Circle & Alphabetsalad's bloghop.